These pictures are from Renee Fieldhouse, a Phantom Regiment baritone player from 1974-1980 and current member of the Phantom Regiment Alumni Board. We take our 50th anniversary T-shirt deliveries very seriously here in Northern Illinois! At the recent Show of Shows in Rockford, Christine Garceau (1974 Phantom Regiment snare) and I hatched a plan to deliver an anniversary shirt to her good friend Bob Whittock (Phantom Regiment alum, 1974-1976) who resides in the gorgeous city of Prague in the Czech Republic. I had a trip planned to Europe the week following the show which included a stay at one of Bob's holiday rental apartments in Prague. 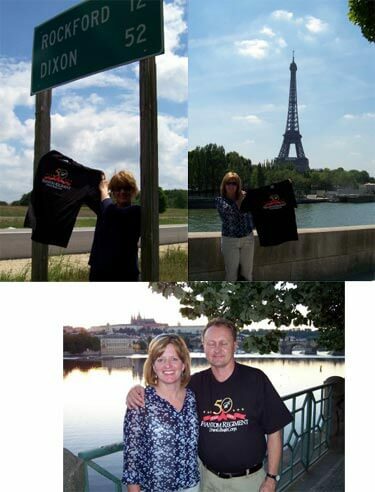 The shirt departed Rockton, Ill., on July 12 (12 miles north of Rockford as the sign in the photo shows), made a stop in Paris over the Bastille Day weekend, and reached its final destination on July 17. I highly recommend a visit to this fine city, have a visit with Bob and chat about vintage drum corps!